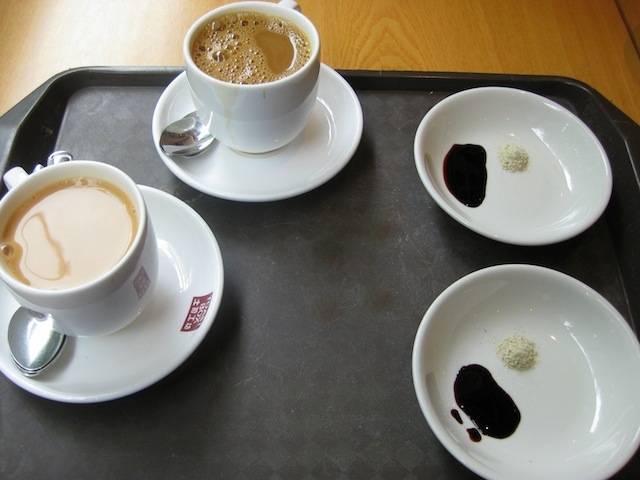 Kopi tiams (or kopitiams) are very popular traditional breakfast and coffee shops found in parts of South East Asia. 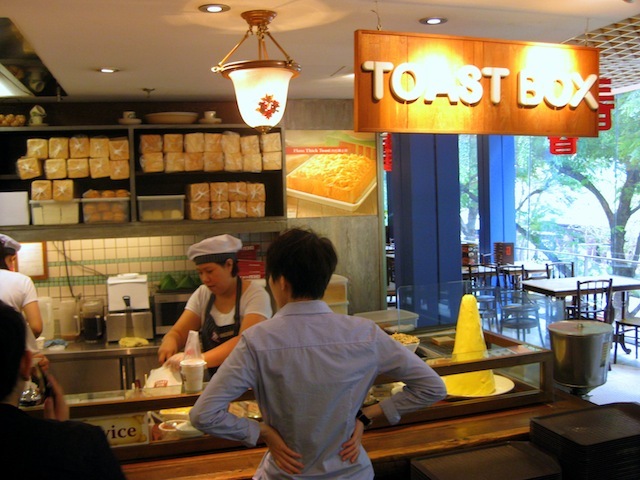 Toast Box, owned by the BreadTalk group, is a chain of modern kopi tiam style cafes in Singapore, and we happened to visited the location at Wisma Atria Food Republic, across from one of the smallest McDonald’s in the world, and Topshop. Look at that conical mound of butter! Sweetened condensed milk and evaporated milk are usually added coffee and tea beverages in Singapore. Coffee or “kopi” is hand pulled at Toast Box, ensuring an extra smooth filtered coffee with a heavenly aroma. 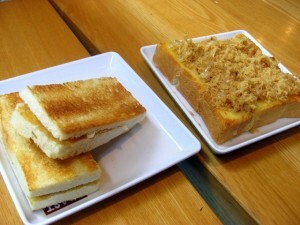 We ordered toast box sets 1 and 2 ($3.90 SGD per set). 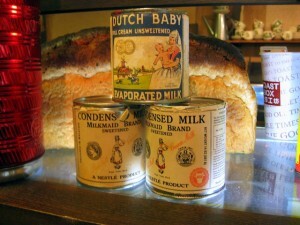 They both come with toast, 2 eggs, and hand pulled kopi or teh (coffee/tea). We ordered one kopi c and one teh c, and since I ordered my eggs hard boiled, they took longer to be served, so aren’t picture. 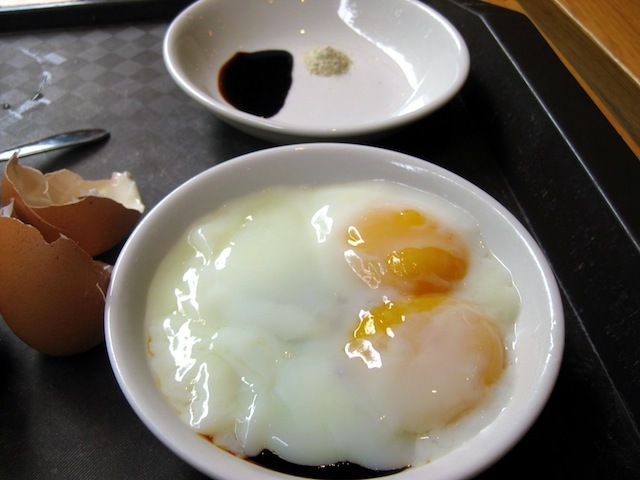 Soft-boiled eggs, or half-boiled eggs as they are called here, are the way the sets are usually served – cracked into a dish to which soy sauce and pepper are added. You can dip your toast into the hot and runny eggs. 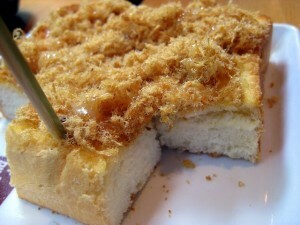 I chose delicious kaya (coconut jam) toast, and Gary got the pork floss crispy-grilled thick cut toast. We just coudln’t get enough of pork floss in Singapore – especially the famous pork floss buns at BreadTalk. Yum!